Electric Corby is a community interest company established to act as a test bed for projects at a community scale which promote new practical and sustainable ways of living, working and travelling. This has led to Electric Corby being invited to work with a number of European projects with partners across Europe, including France, Spain and Italy. These projects have placed Corby at the forefront and brought money from the EU into the town to deliver a real benefit to the community whilst meeting the challenges of energy demand and climate change. District of the Future (DoF) is one of the EU projects that Electric Corby is a partner in, which aims to reduce energy consumption and greenhouse gases by 30-40% by utilising ICT tools to implement energy-saving strategies on a district level. As part of DoF’s third and final year, Electric Corby has been working with a local school, Corby Technical School to run the ‘Switched on Thinking’ project – a STEM project which introduced students to the concept of energy, why we need to save it and how we can reduce our energy consumption. The project culminated in an energy-saving innovation competition, in which students designed an application or product that would enable the user to save energy around the home. These were then presented to a panel of judges, including the Sustainability Officer of Corby Borough Council and representatives from Electric Corby. The ideas were scored based on criteria covering their impact on energy saving, ease of use, and their level of innovation. The students produced an impressive range of ideas, with many of them demonstrating an interactive app. Many of these ideas focused on an app to monitor energy consumption within the home. Students came up with many innovative features including historical data, the ability to monitor water and gas, daily energy-saving tips and feedback dependent on how much energy they were using based on their normal consumption and the weather. Some students even designed their own posters so that their products were ready to market. 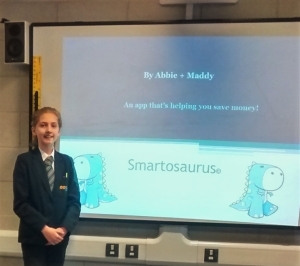 The winning idea was called ‘Smartosaurus’, a clever product that saved energy by automatically turning off plugs when an appliance, such as a phone, was fully charged. This was accompanied by an app that enabled users to see which of their devices were fully charged and give them the ability to manually switch the appliances charging on or off. This idea impressed the panel due to its uniqueness and its capability of saving energy, accompanied by an impressive presentation where the students showed the panel the app on their own phone. 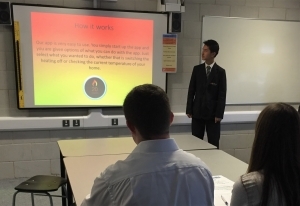 It was exciting to see how students engaged with the project, and were able to put their learning about energy saving into practice whilst demonstrating their creativity, innovation and excellent presentation skills. 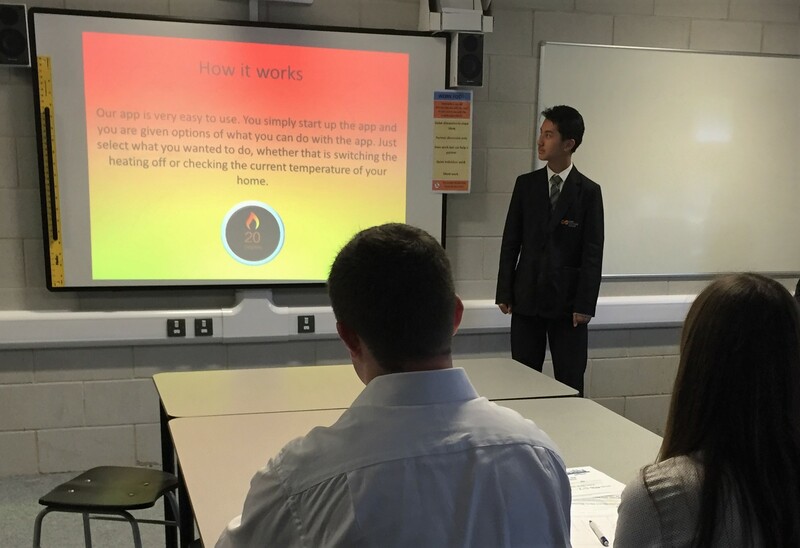 The students also greatly enjoyed the project, with feedback from the students showing that the project helped them to understand how to be more energy efficient, and almost all said they would recommend the Switched on Thinking project to a friend. In particular, students enjoyed an experiment that allowed them to understand how much energy individual appliances used, such as kettles and lightbulbs etc., and were surprised by how big the difference in energy consumption was between a normal and energy-saving lightbulb.